On dark winter mornings, bring a little zing to your day with this lemon scented sight words sensory tub. The tub smells so good! It’s energising and lovely to play with, and it’s also great for some sigh words practise. 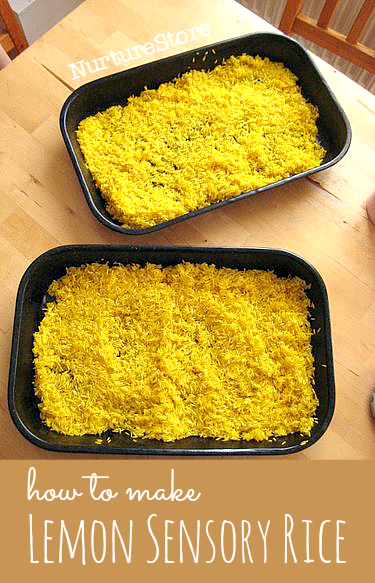 Here’s how to dye and scent the rice, and a fun idea for sight words play. To start with, make your lemon rice. 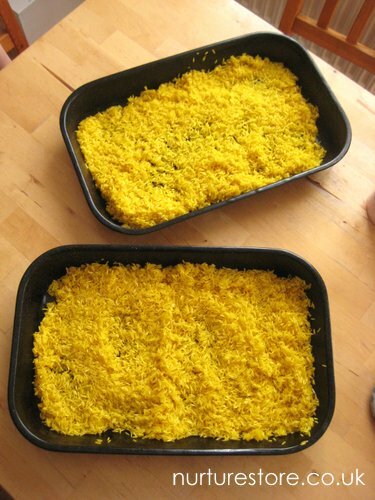 We use uncooked rice and add some yellow food colouring and a little lemon extract. 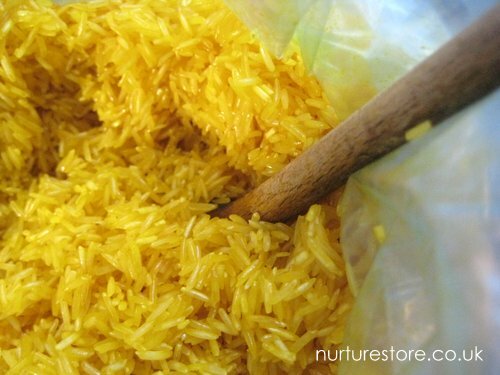 Place the rice, dye and lemon extract in a plastic food bag and scrunch, squash and squeeze until the colour spreads right through the rice. Lay the rice out over night to absorb the colour and essence and to dry. And then you’re ready to play. We love using it in a sensory tub to practise our sight words. The lemon smell is so uplifting and gives the senses a boost. I filled a tub with the rice and add in some fridge magnet letters. The children used little scoops to hunt out the letter treasures and use them to make the sight words they are working on. As well as the zingy smell, the three dimensional shapes of the letters help the children to learn with all their senses. 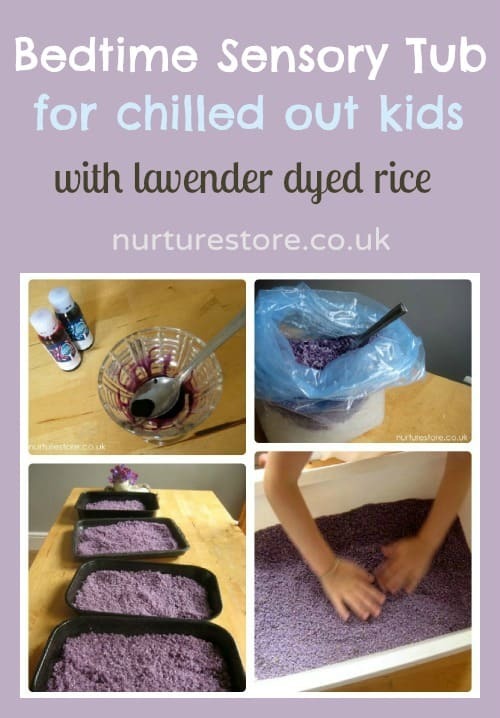 At the other end of the day, try our bedtime sensory tub which uses calming lavender to help children chill out. 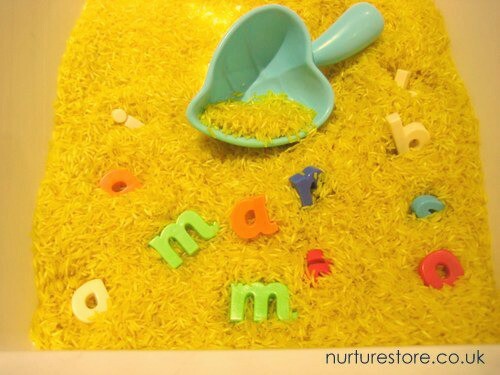 The boys always love to play with rice and I’m looking for fun sight word activities, so this is a perfect combo! 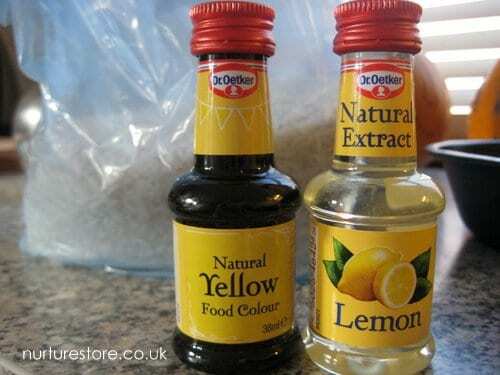 Off to check my cupboards for lemon extract! When I saw all the letters I was SURE the base was going to be alpha-noodles!!! THAT would be cute!!! 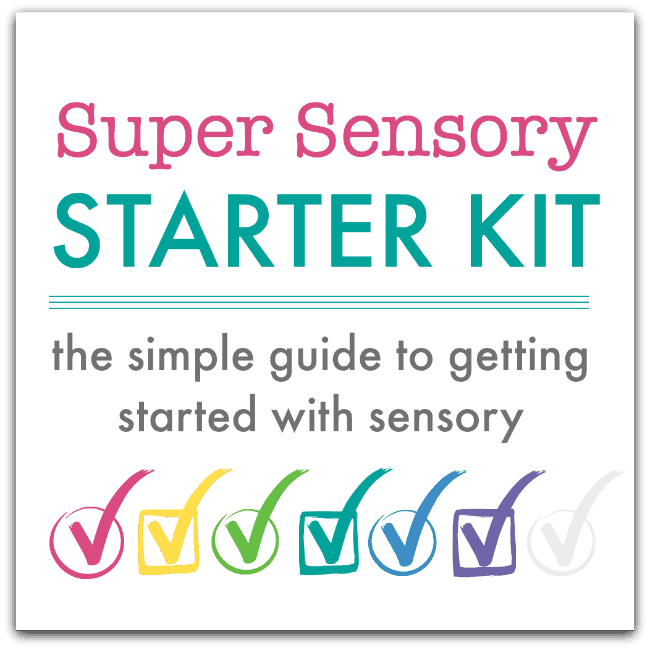 I love the idea of a scented sensory bin! Oh, love the zingy morning and then the calming lavender evening version. What age would you say this is suitable from? We have an 8 month old visitor for the next coupe of Mondays & Tuesdays, as long as I don’t let him put it in his mouth, do you think it would be ok? Hi Cara. Yes, I think it would be lovely. Obviously you don’t your little one to eat any of it, but all the ingredients are food-based and would be great to play with. Have some drying for the 18 month old to play with tomorrow. Had lemon essence in the cupboard and the rice smell so good every time I touch it. Will it remain slightly sticky? Have only ever used hand sanitiser to colour before. Hi Nina. That might depend on the type of colour you’ve used. I find ours soaks in.